Iron roofs. Examples of design. Description, illustrated with working drawings. Arthur Walmisley began his career as a civil engineer as pupil to R.M. 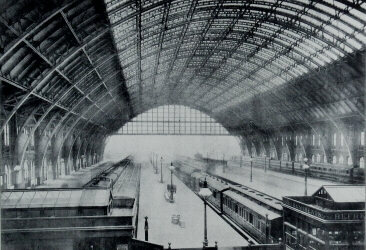 Ordish where he worked as a draughtsman on drawings for the roofs of the Albert Hall and St Pancras Station. This involved complex design calculations and the detailing of structural ironwork. He went on to work with a number of architects and engineers, including John Johnson, architect, for whom he executed drawings of the rebuilding of Alexandra Palace. In 1878 he set up his own practice as a civil engineer and acquired a reputation as an expert in iron roof structures with the National Agricultural Hall in Olympia and the Carlisle Market Hall. His great book on the subject remains a major source of information on iron roofs. He felt that it was a subject much less well studied than that of iron bridges and set out "to provide a record of the style of design adopted in some of the best known roofs that have been erected". These include the roofs of the Albert Hall, Alexandra Palace and the Aquarium Westminster together with some major London railway stations, such as Broad Street, Cannon Street, King’s Cross, London Bridge, Liverpool Street, St Pancras and Victoria, as well as roofs in Bristol, Carlisle, Dublin, Exeter, Glasgow, Manchester and the great curving roof of York station. The volume is splendidly illustrated. A second edition appeared in 1888. Large 4to. (x) + 37 + (1), including some text ills. Ink-litho frontis. and 65 photo- or ink-litho double-page plates, some folding, numbered 1-64, 20*. Modern cloth.